Disability Awareness Week for fall semester 2018 is now underway at Salt Lake Community College. Coordinated by the Disability Resource Center, the week-long affair is marked by daily events that highlight the experiences of people living with disabilities and are aimed to remind students and faculty alike that disabilities are an ordinary part of life. This year’s theme is disability and the arts. The week’s events revolve around the connection between the two subjects and the value of art to relay one’s experience with disability. 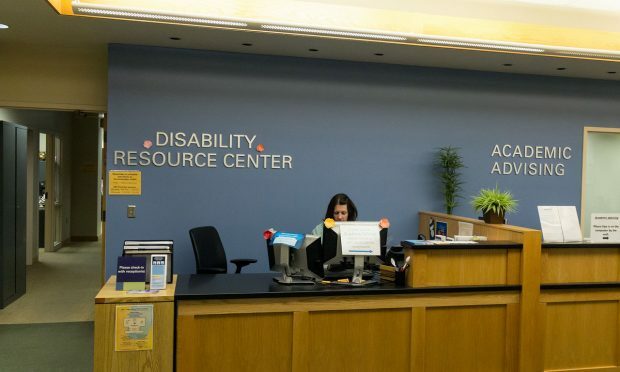 The Disability Resource Center is SLCC’s premier department for ensuring accessibility on campus for students with disabilities. They are responsible for providing accommodations for students, whether that be in the form of assistive software, testing accommodations, or sign-language interpreters. They serve between 2,200 and 2,500 students. The center hosting a variety of events to support their mission, including the Assistive Technology Fair, which runs from 11:30 a.m. to 1 p.m. Tuesday at South City Campus. This fair will have over 20 vendors and is meant to showcase technology that aids people with disabilities. “If you want some pizza and to come and check out the different updated technology with some hands-on experience, this is the place to come and do it,” says Edebiri. Assistive technology plays an important role in facilitating accessibility, especially in an academic setting. In a similar way that new technology has increasingly changed our economy (through digital automation), transportation (through ride-sharing apps) and even the way we connect with each other (through social media), the ability to accommodate the needs of students with disabilities has increasingly changed as technology does. Stephanie Mathis, the Executive Director of the Sego Lily Center for the Abused Deaf, will talk about her passion for dancing and how being deaf hasn’t prevented her from artistically expressing herself. The event is scheduled for Wednesday from noon to 1 p.m. in the Student Event Center at Taylorsville Redwood Campus. Finally, Cara Jean Means, the artist behind the “GRIP: Conversational Portraits on Mental Health” exhibit currently on display at South City Campus will discuss her series of paintings in an artist talk. The talk will be held at noon Thursday in the screening room at South City Campus. Students can visit the Disability Resource Center at the Taylorsville Redwood, South City or Jordan campuses if they have any questions about their services.